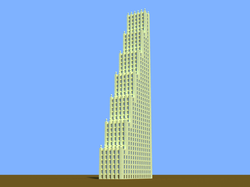 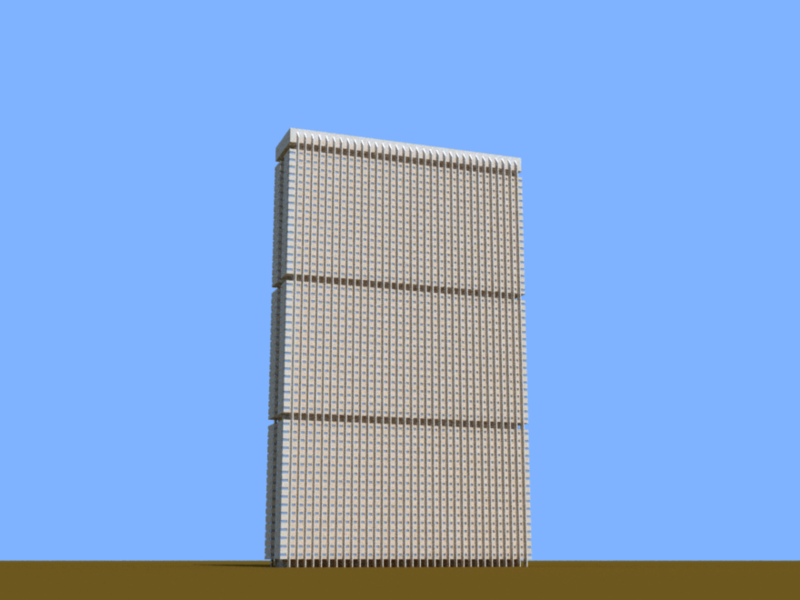 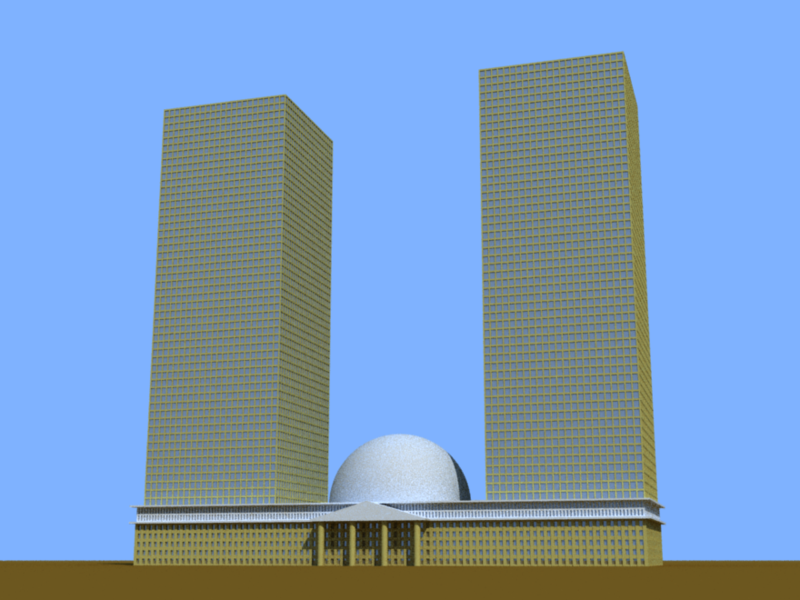 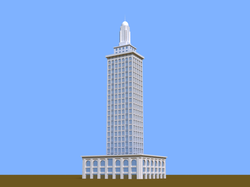 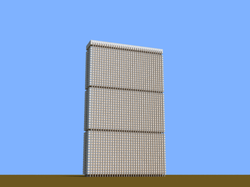 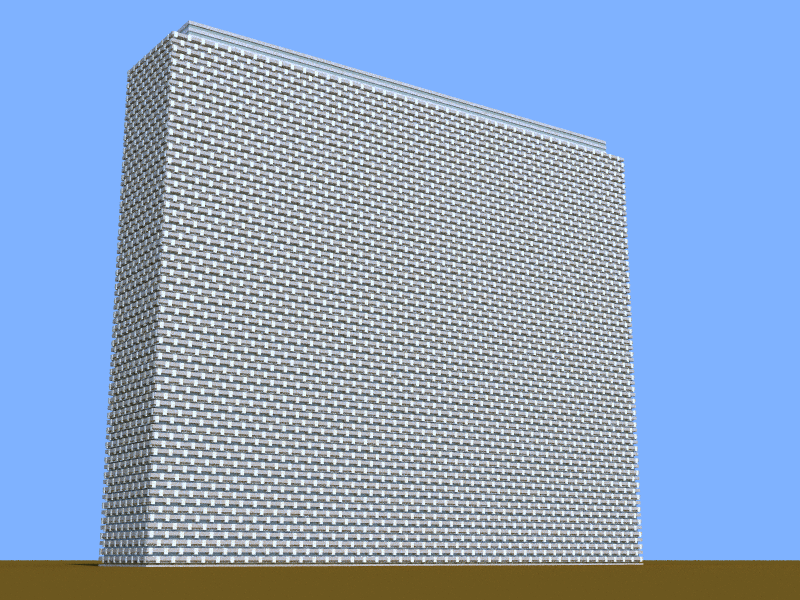 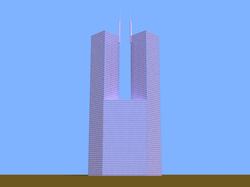 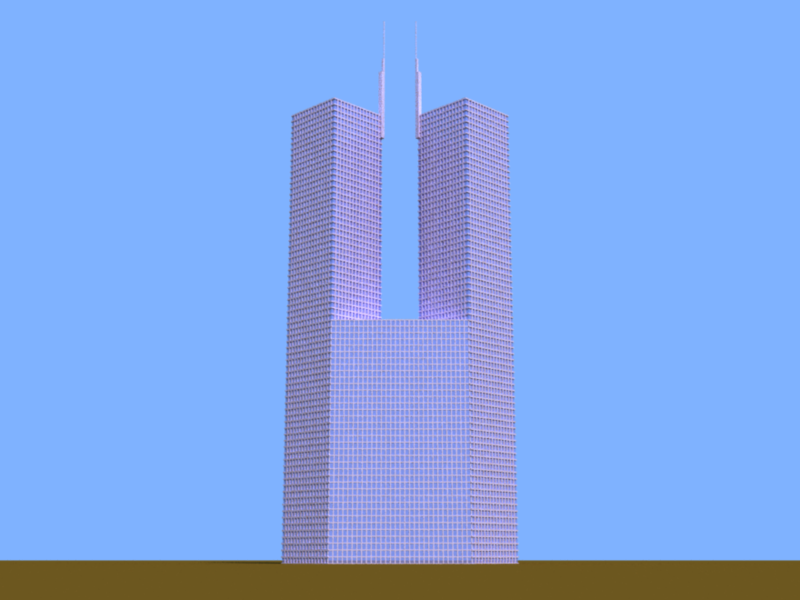 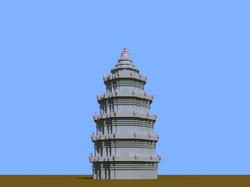 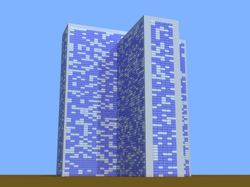 A collection of building models in the Art of Illusion scripting language. 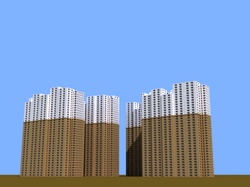 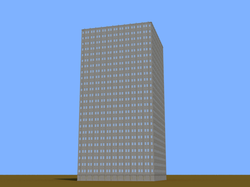 Most buildings can be scaled and the number of floors adjusted by parameters found at the top of the script. 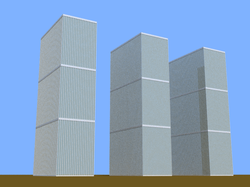 Some have additional options available. 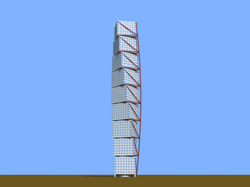 Designed primarily as background objects, to fill skylines or large cities in the mid to far distance. 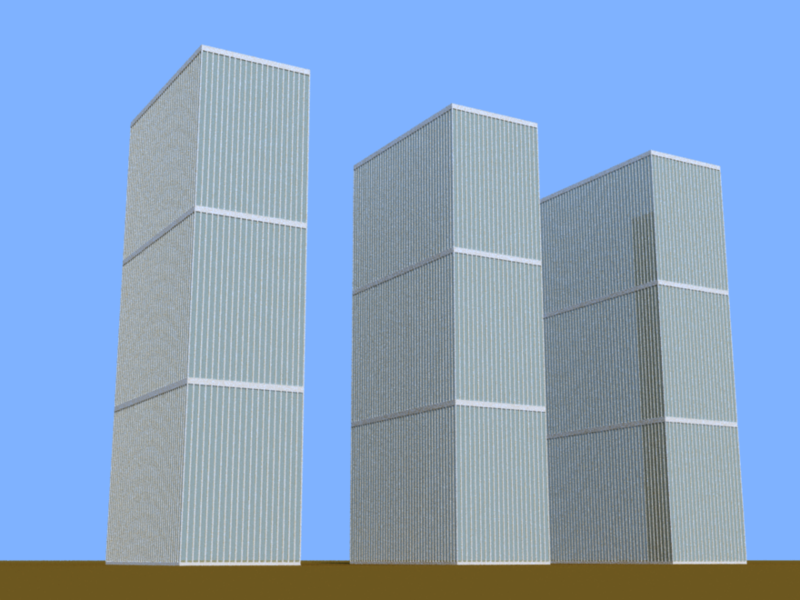 Some higher detail and appropriate for foreground objects. 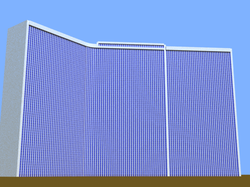 Textures easily modified to suit your needs. Feel free to use for your projects, films, wall art, or whatever else you want, free of charge. 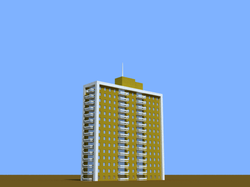 Credit or a link back appreciated if practical. 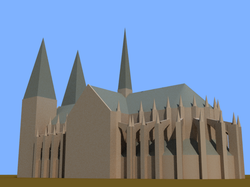 All models provided as is, with no guarantee of correctness or quality. A brightly colored building with a triangular lattice framework. Optional antenna structures on top. 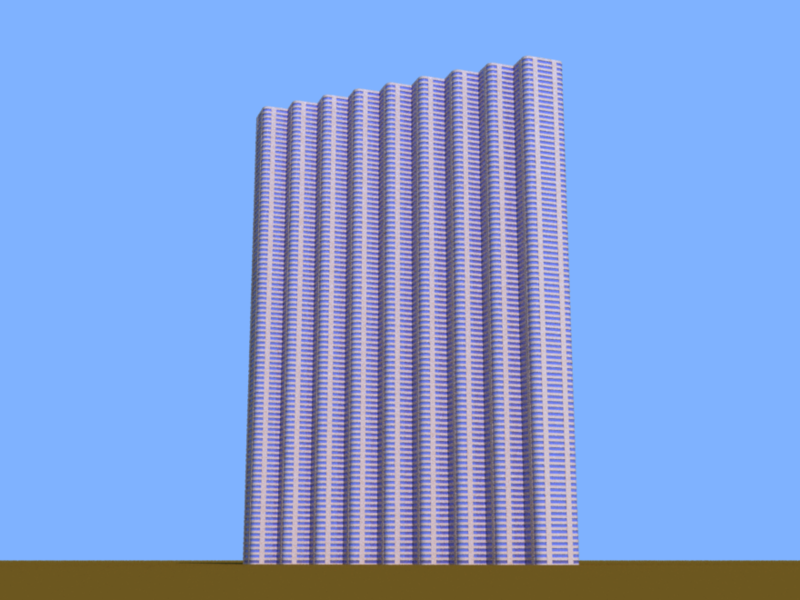 A building that is similar to an accordion fold. Number of sections easily changed. 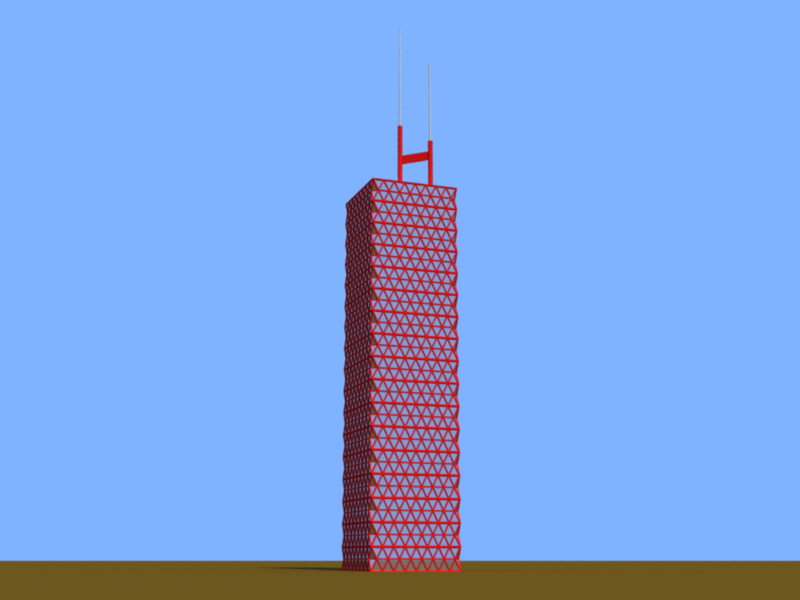 A building based on The Ark in North Sydney (aka Coca-Cola Place). 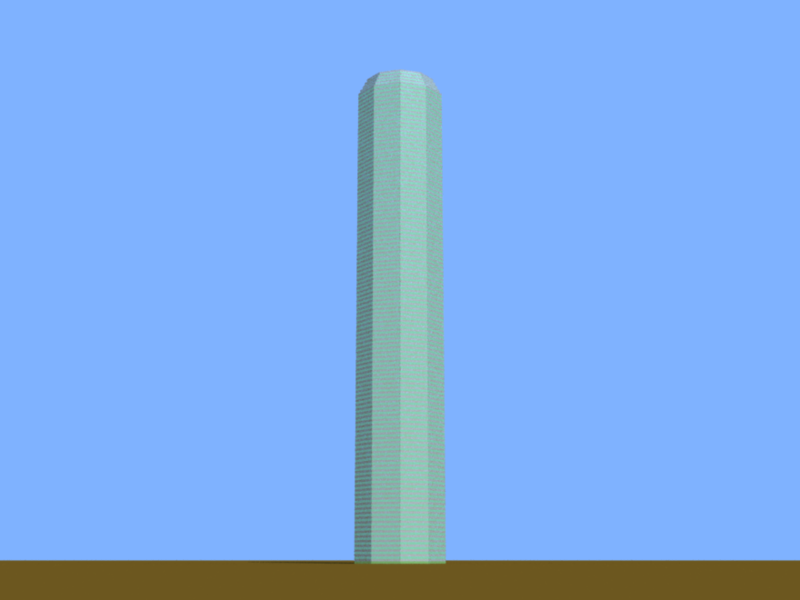 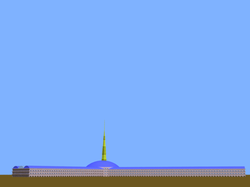 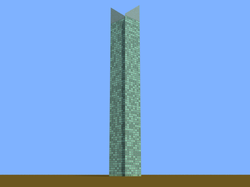 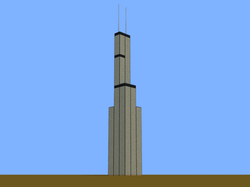 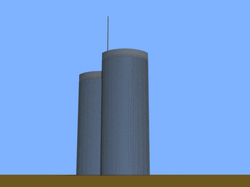 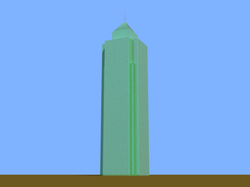 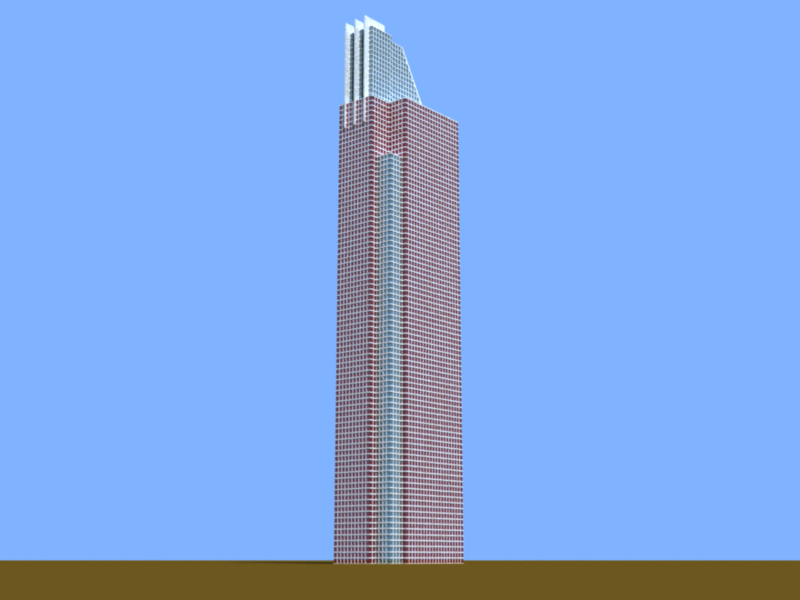 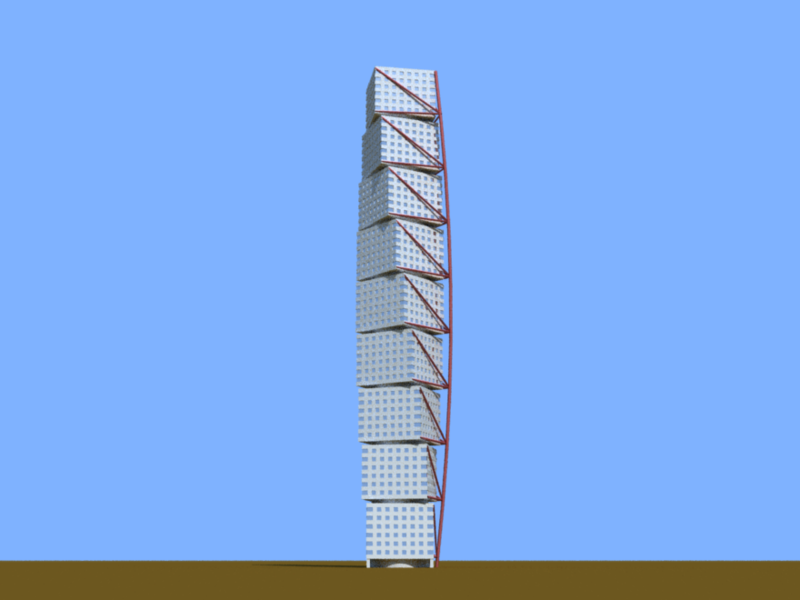 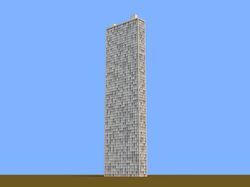 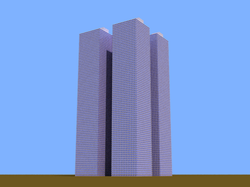 A tall slender building rising out of a wider base. 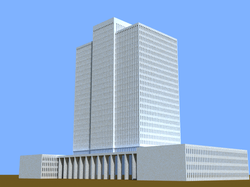 A building longer than it is tall, decorated with light colored blocks. 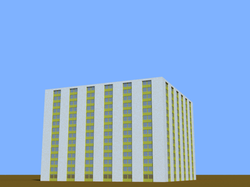 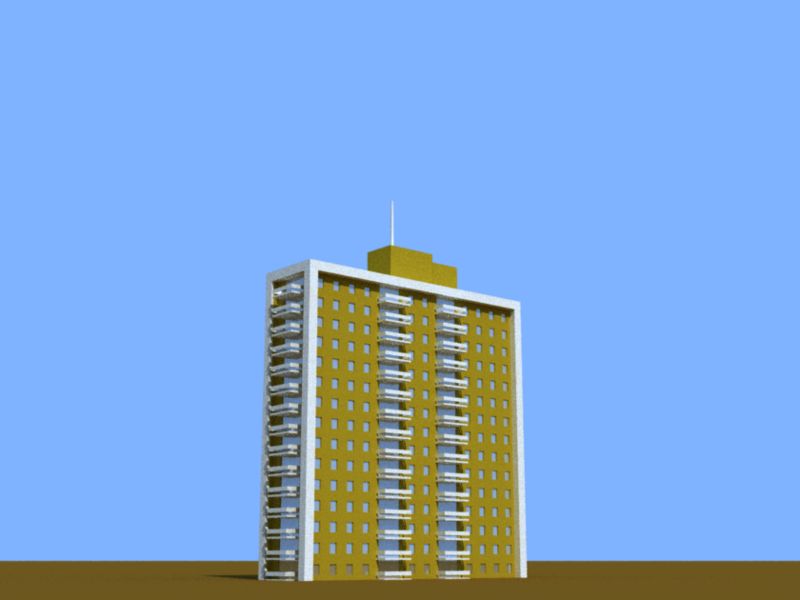 A simple apartment style building. 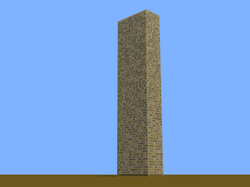 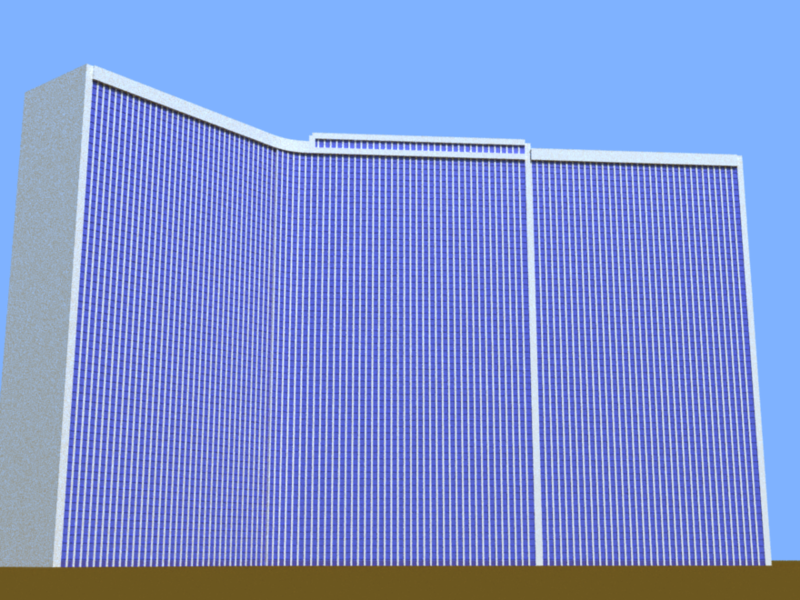 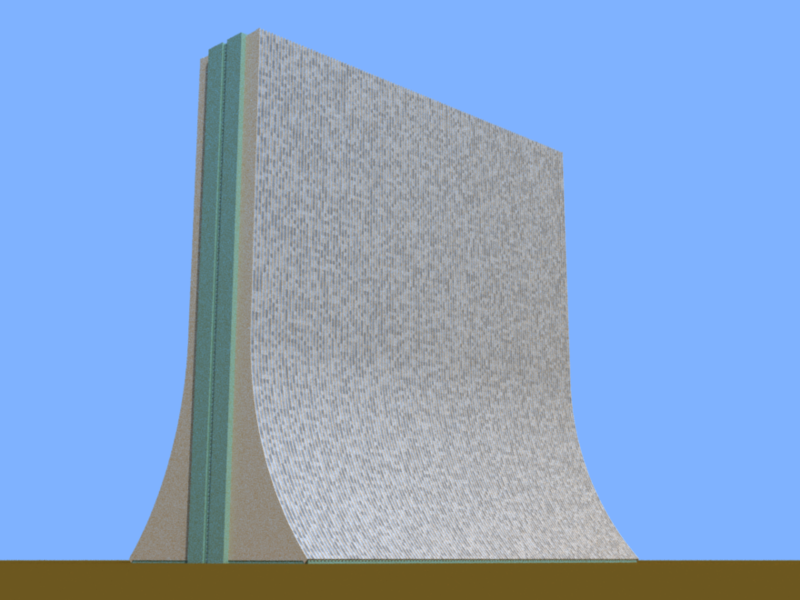 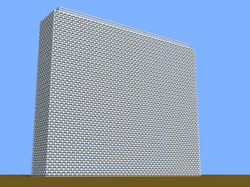 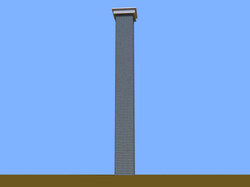 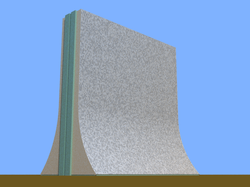 Requires an external texture in the scene file named brick. 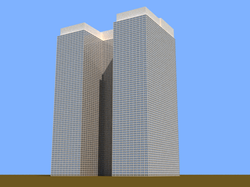 A building with a square footprint and strong horizontals. 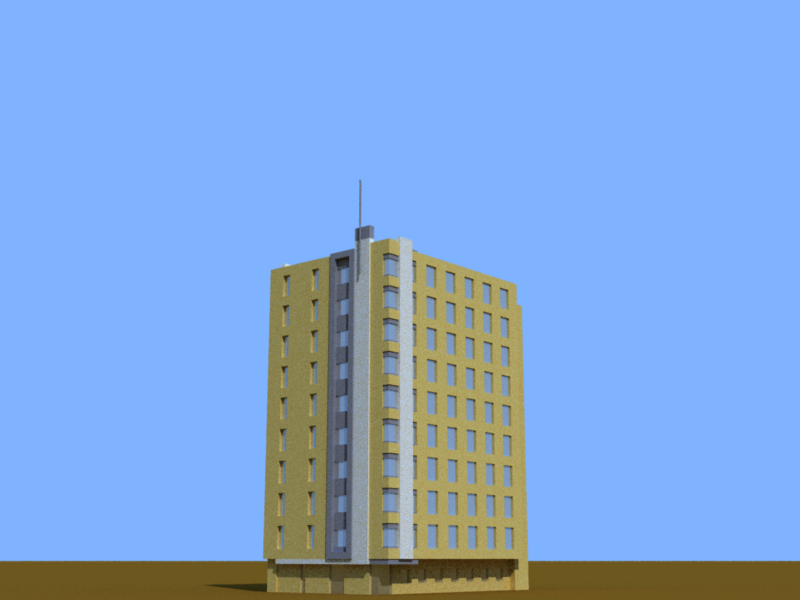 A simple building with strong verticals. 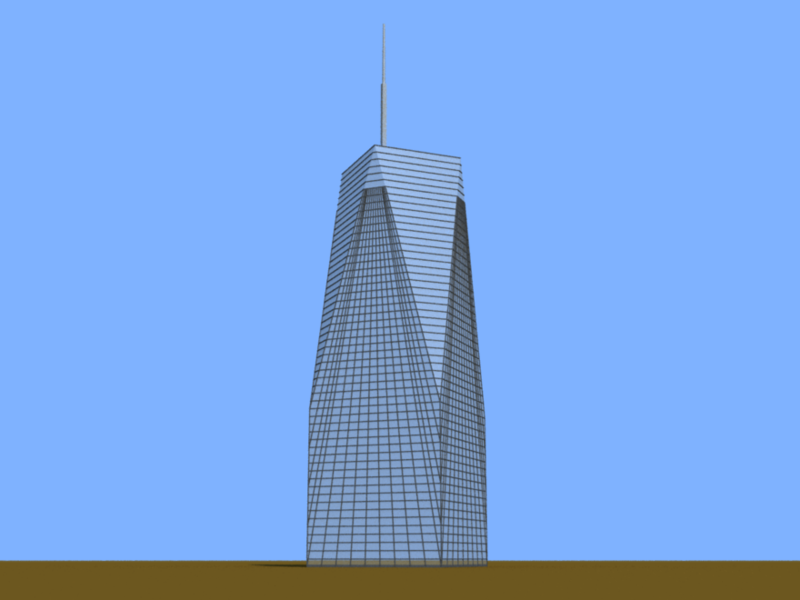 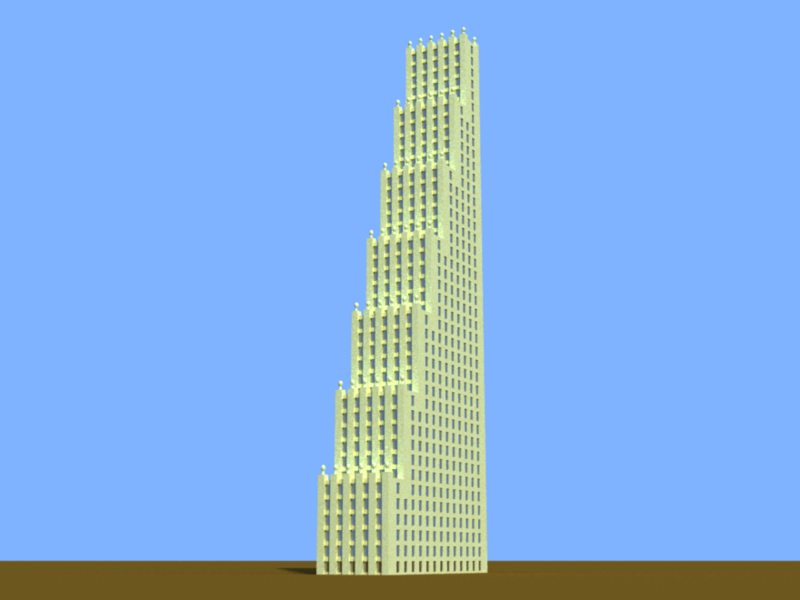 A building based loosely on Carnegie Hall Tower in New York City. 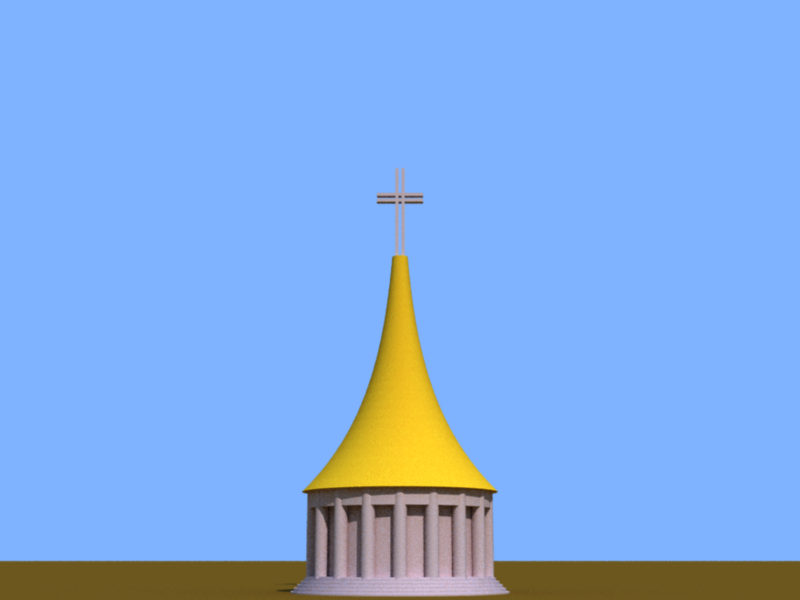 A typical cathederal. 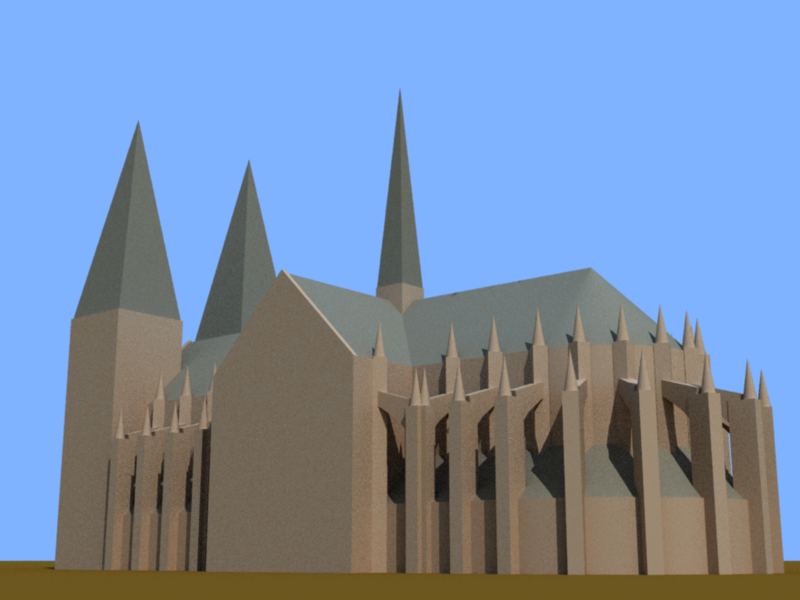 Spire and tower roofs optional. A building similar to the Chase tower in Chicago. 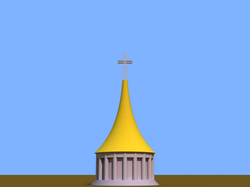 A round church type building. 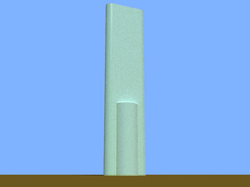 Cross removable. The Church Office Building in downtown Salt Lake City. 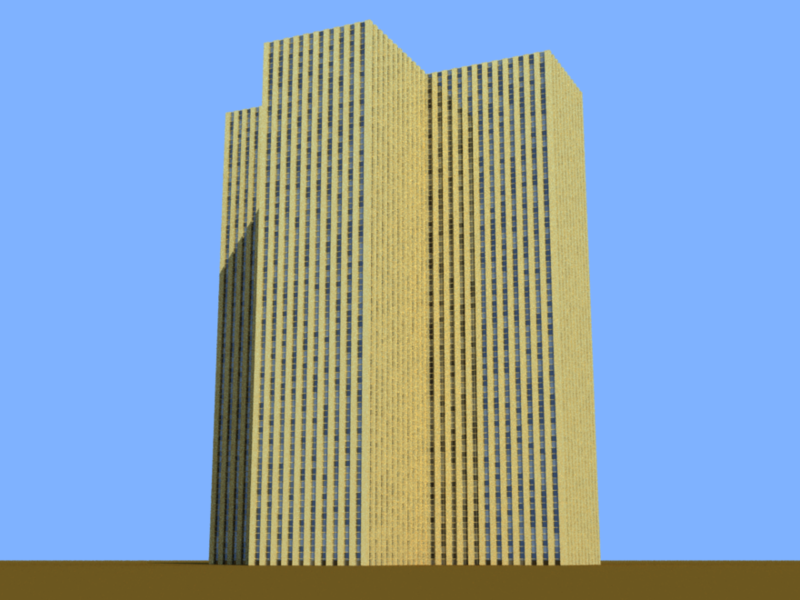 A building with promonent corners. 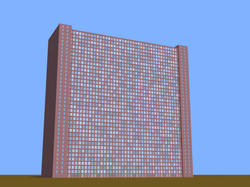 A building with a cross footprint. 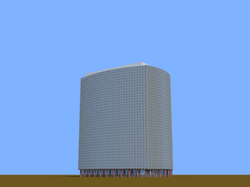 A building simmilar to the CSAA headquarters in San Francisco. 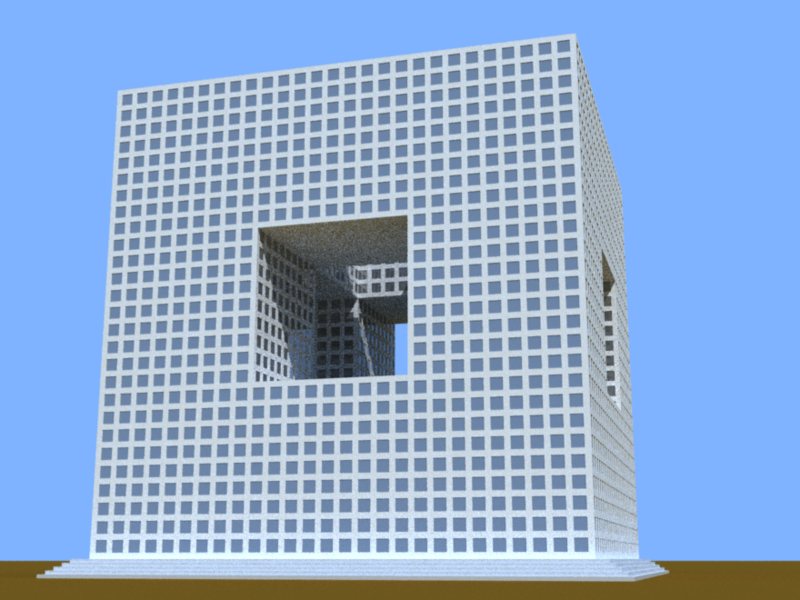 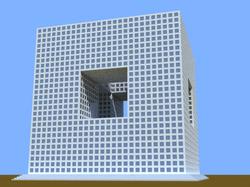 A punctured cube building with optional base. 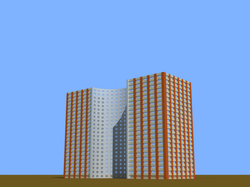 A building with gently curving sides. 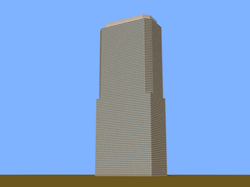 A building where the upper corners are cut away. 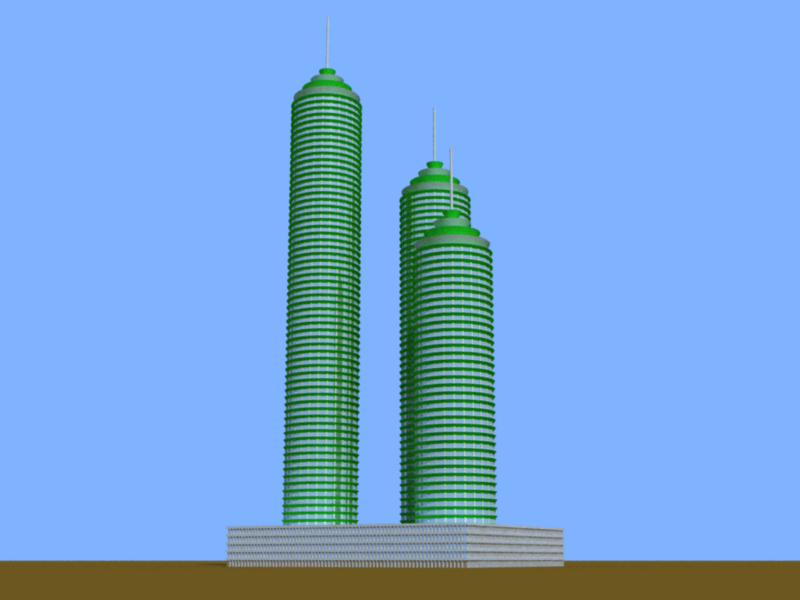 A building topped with several cylinders, including some that are lit. 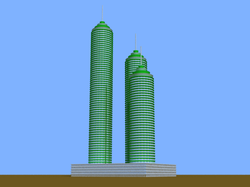 A building made up of two lens shaped sections. 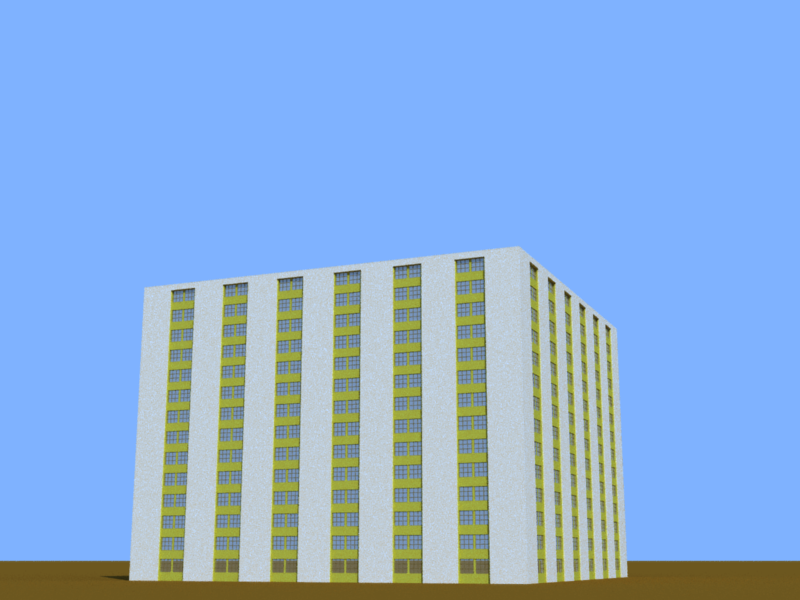 desert towers, a former complex of dorms at BYU. 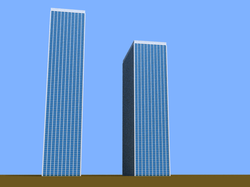 Number and arrangement of buildings easily changed. 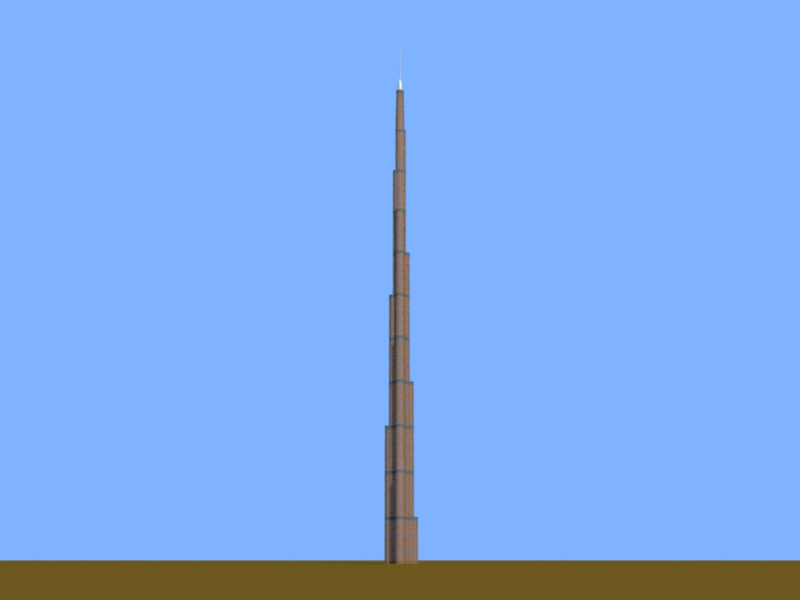 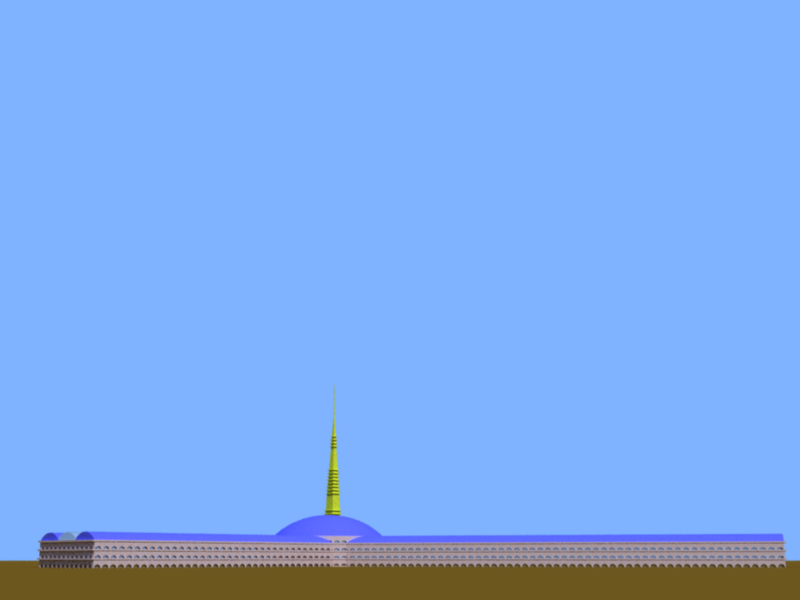 A tall building based loosely on Burj Khalifa. 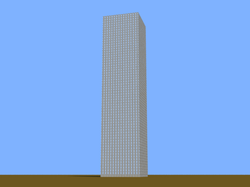 a building in the shape of an L with a rectangular base. 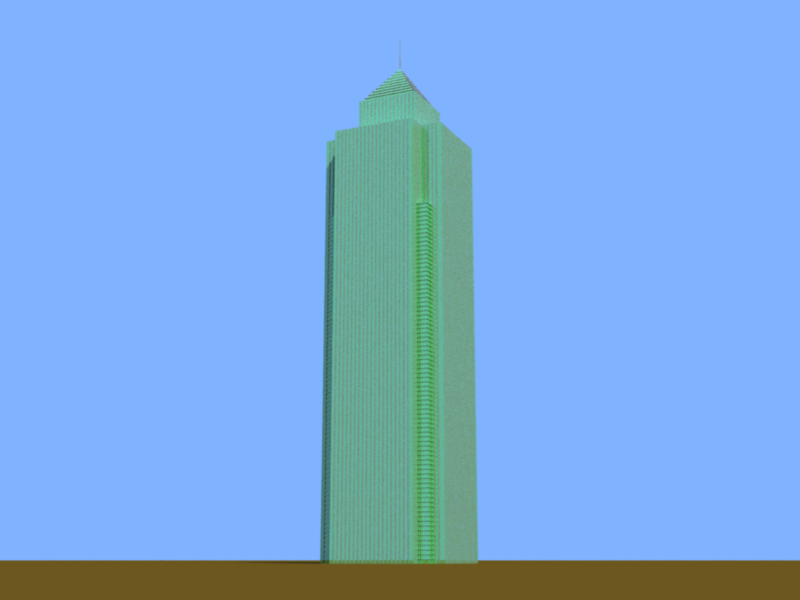 A building inspired by the Wells Fargo Center in Houston. 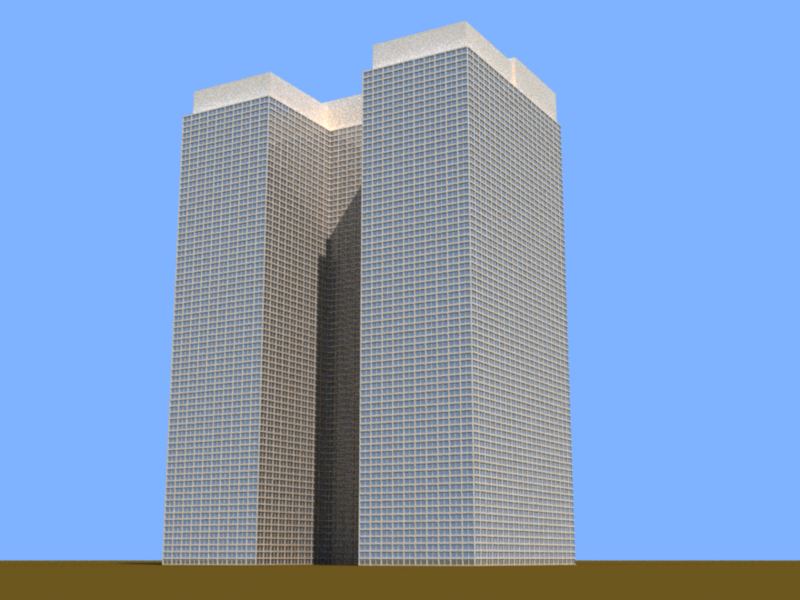 A building simmilar to the fox plaza in LA. 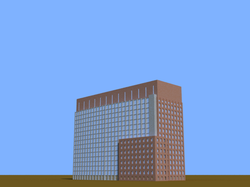 A grey block of a building with rounded corners. 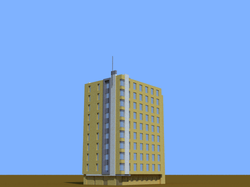 A building that is half one style and half another, heights configurable. 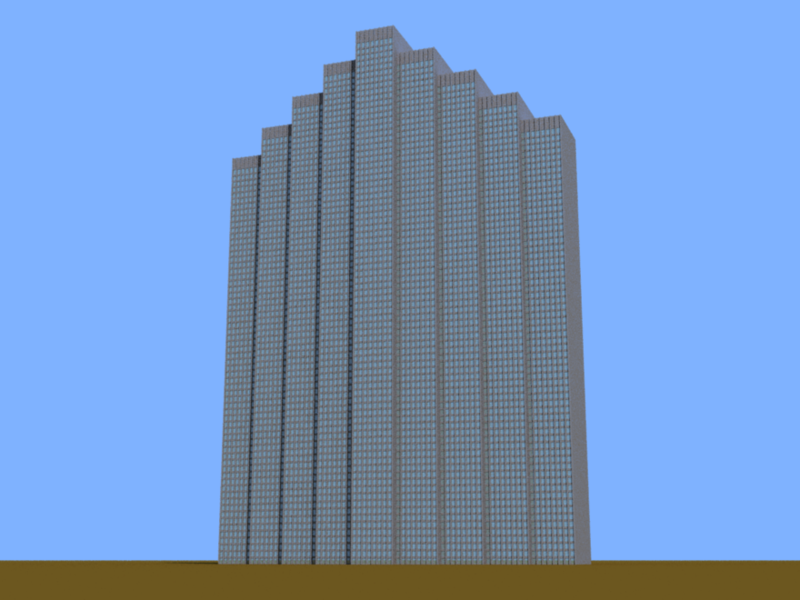 A building with the same basic structure as the Hearst Building in New York City. 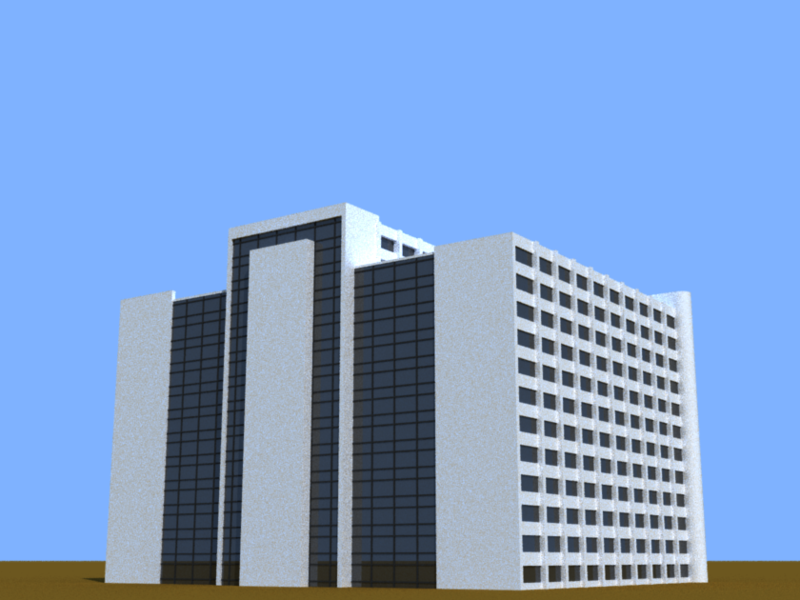 A building like the Vegas Hilton. 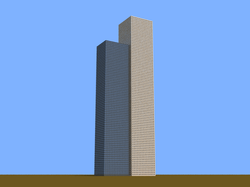 Angle of building adjustable. 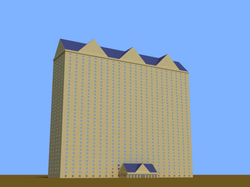 A tall hotel like tower with a peaked roof. A building where the bank of windows is surrounded by a large bevel. 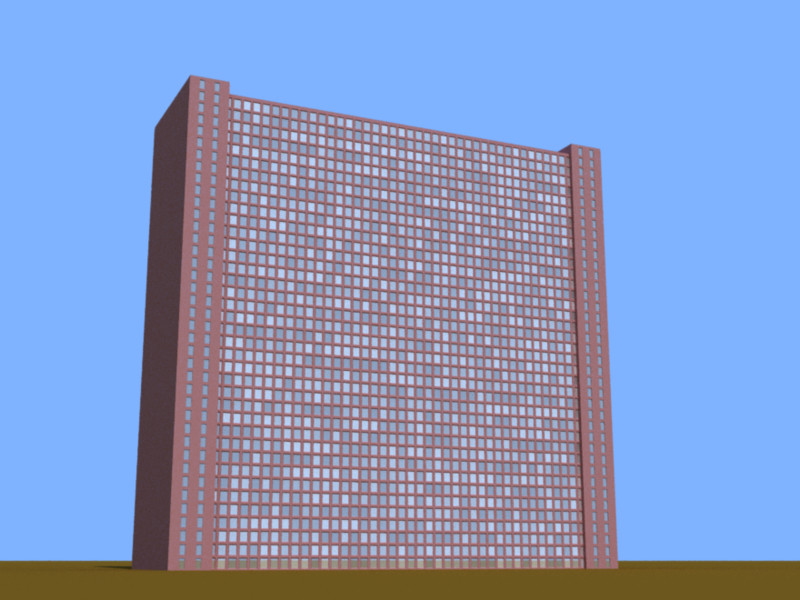 A building with a double convex footprint. 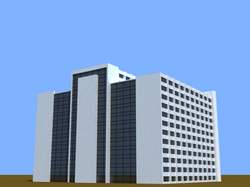 A building based loosely on the Manchester YSA building in Manchester, England. 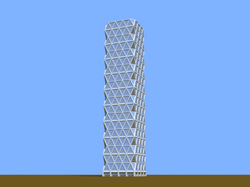 A building loosely based on one proposed, but not built, at the Provo Utah MTC. 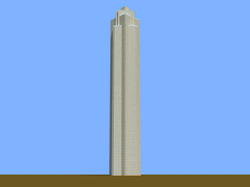 A mushroom top tower, similar to one that exists at 1001 Howard Ave, New Orleans. 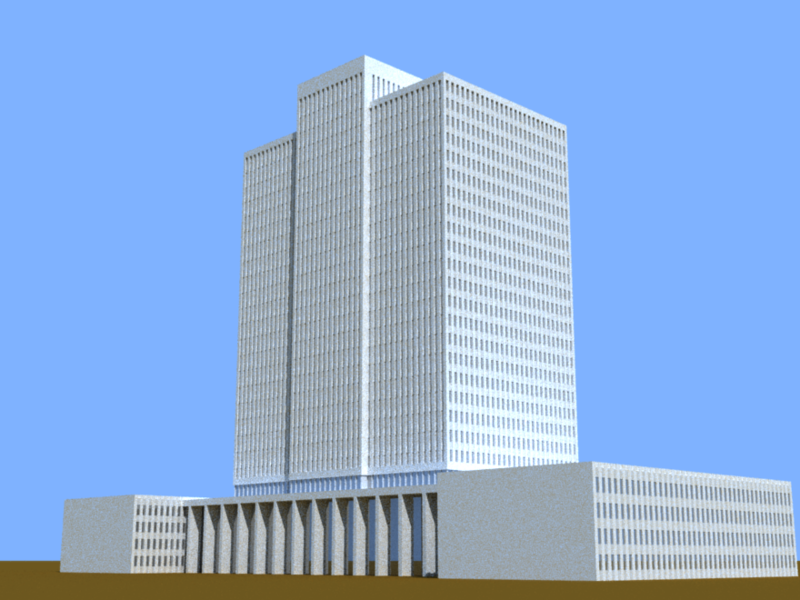 A simplified version of the Oakland city hall. 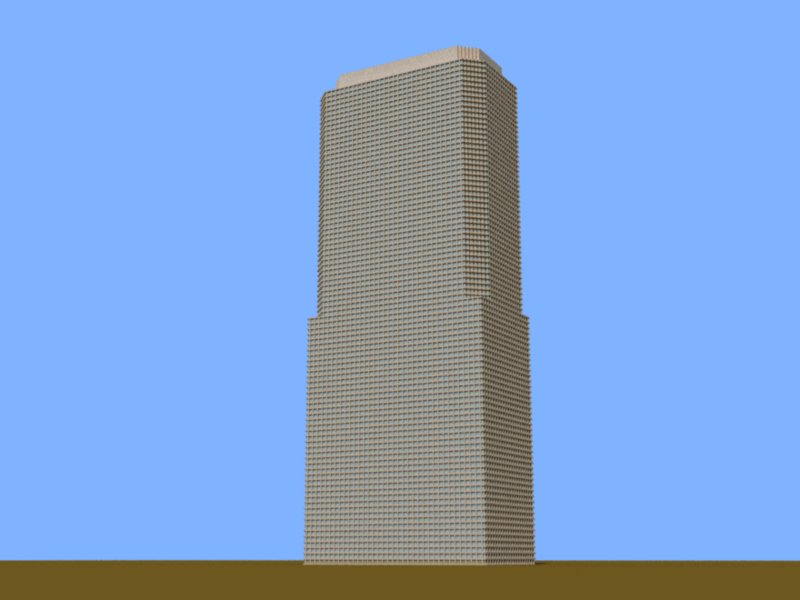 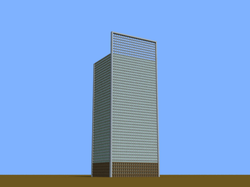 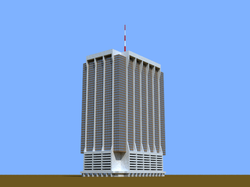 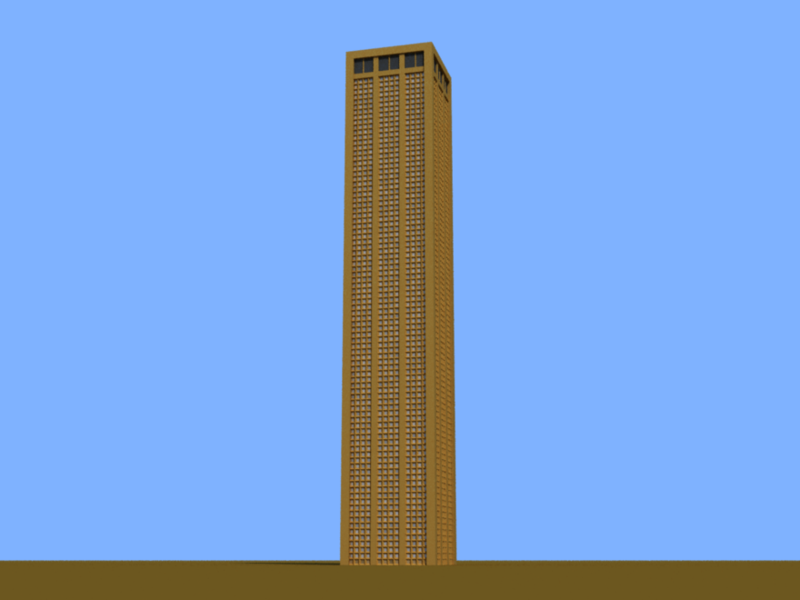 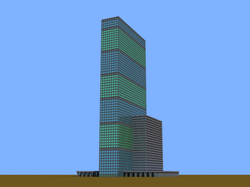 A building with an offset section on the top loosely based on Montevideo tower in Rotterdam. 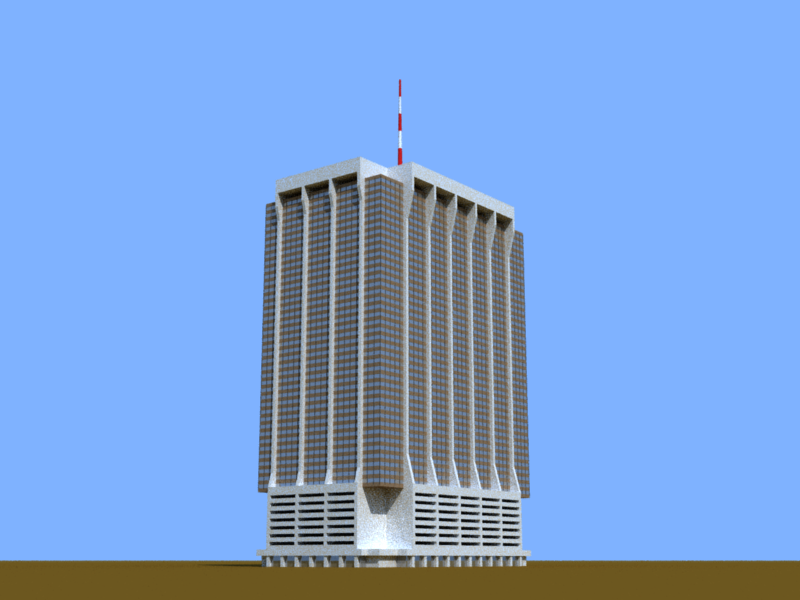 An imposing building for the center of a city. 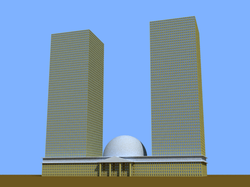 A building characterized by round pillars on the exterior and a 1st floor smaller than the rest. 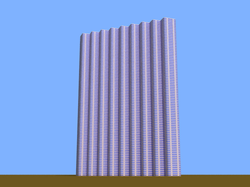 Building has a corrugated appearance. 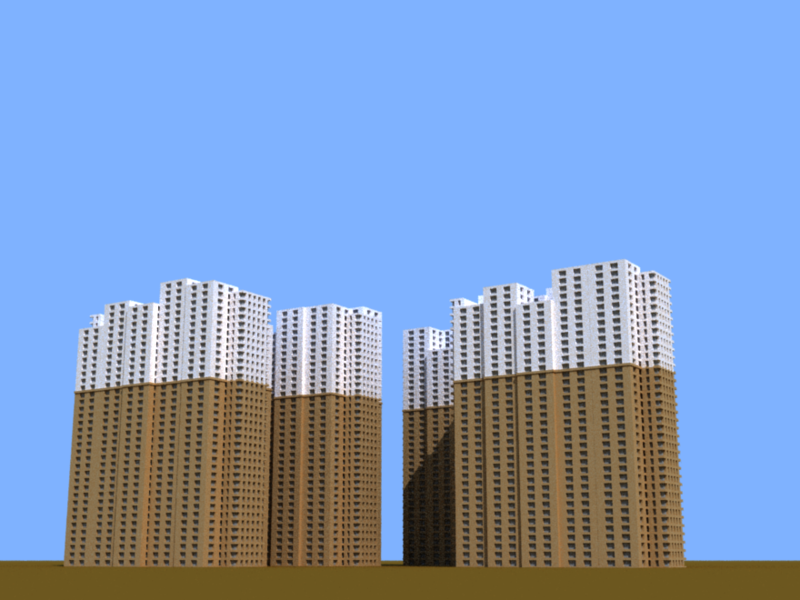 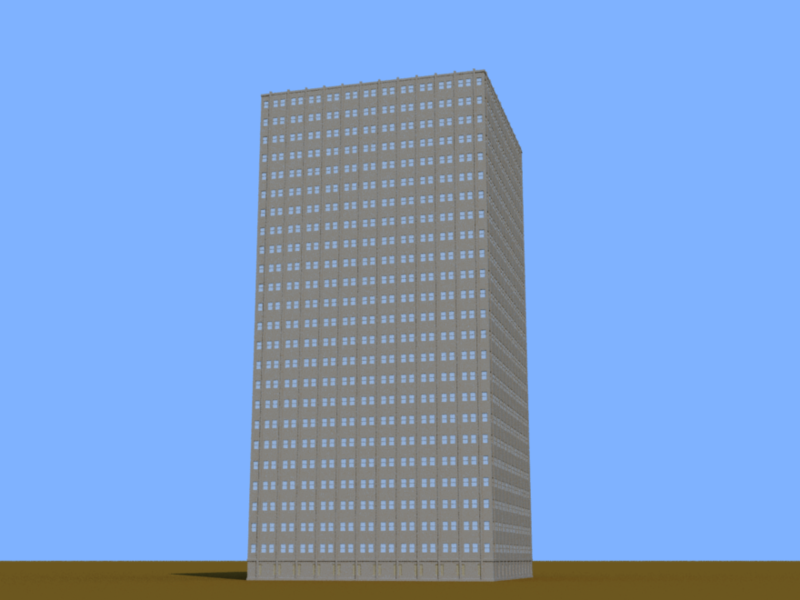 A collection of buildings of random heights. 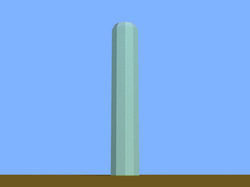 Average height adjustable. 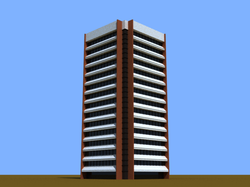 A cylindrical building with balconies and a decorative top. 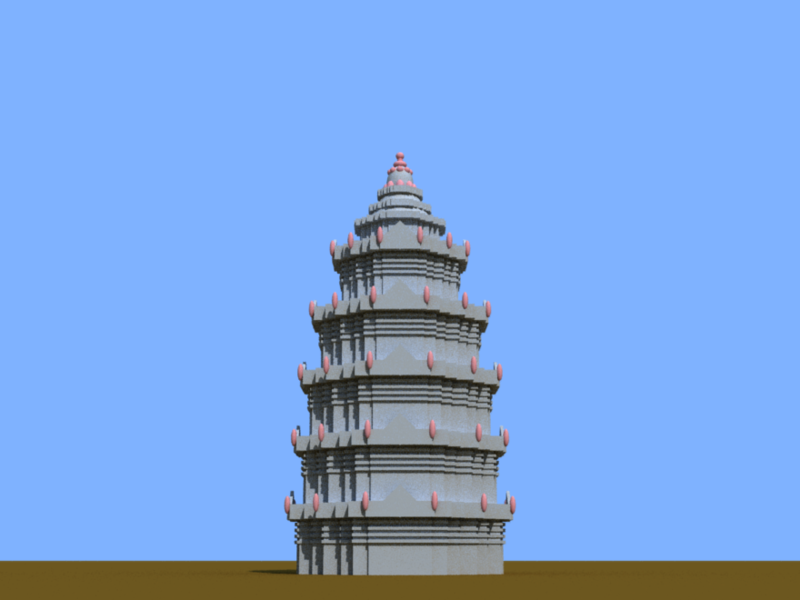 Designed in collaberation with my students. The Sears Tower in Chicago (aka Willis Tower). 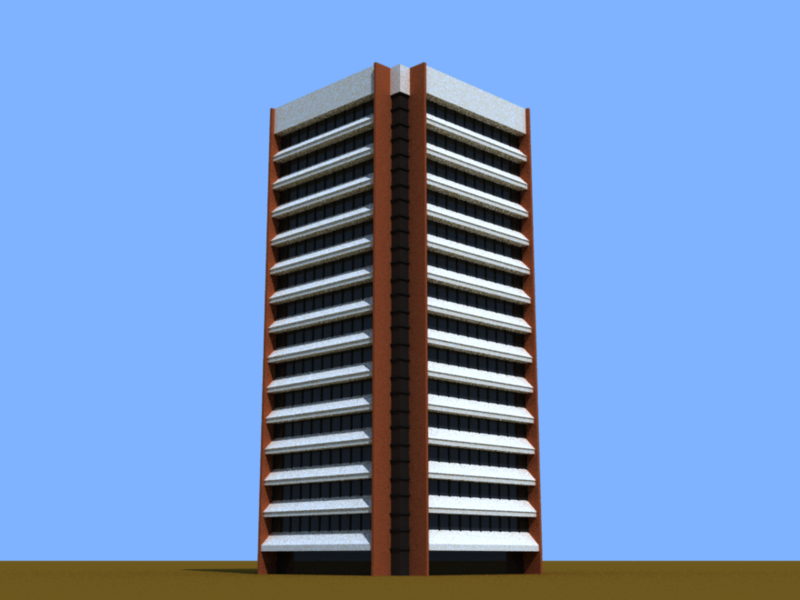 A building based on a building in San Francisco CA. 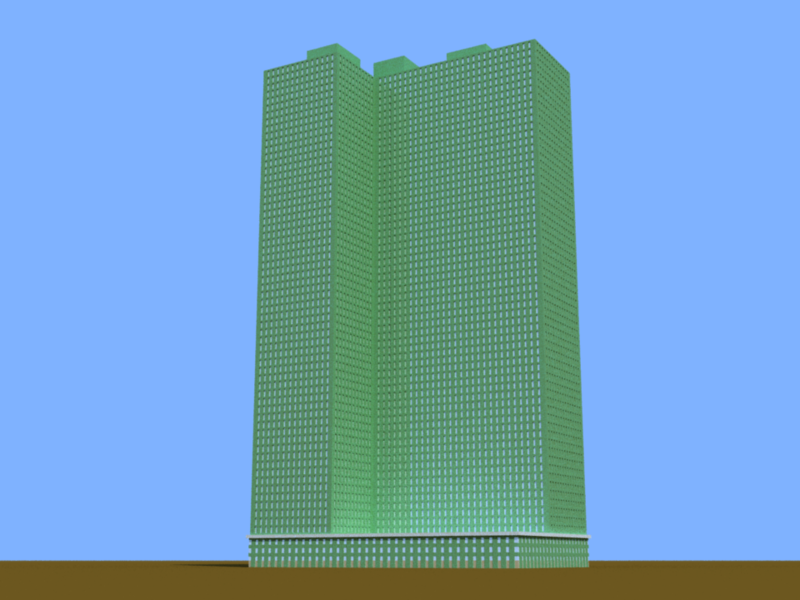 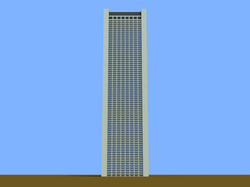 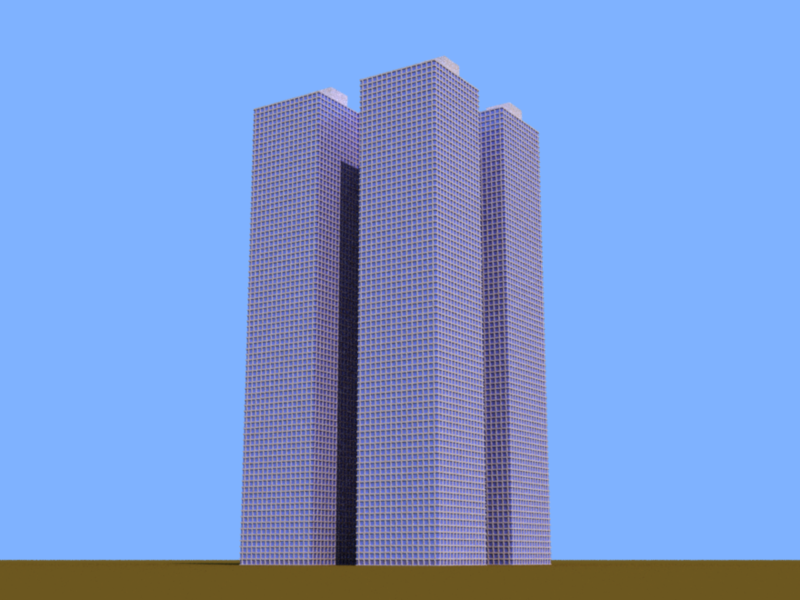 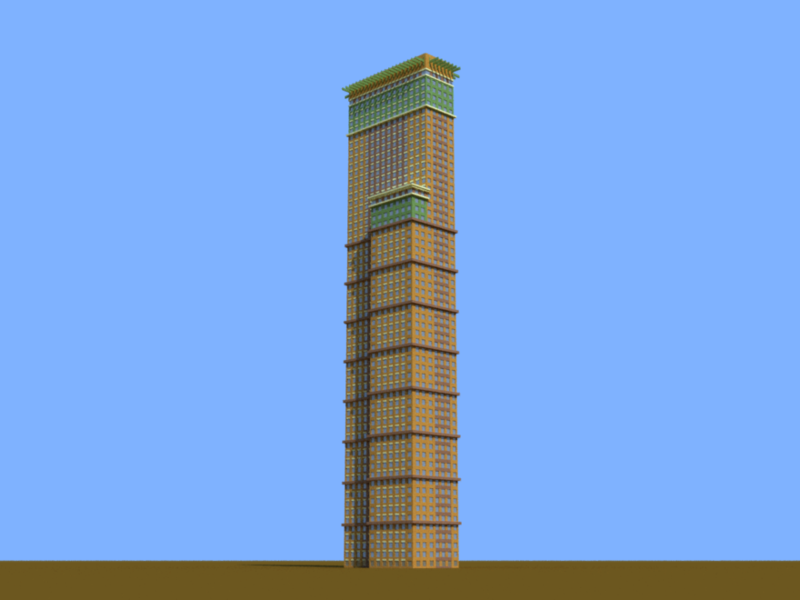 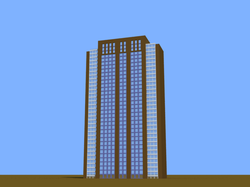 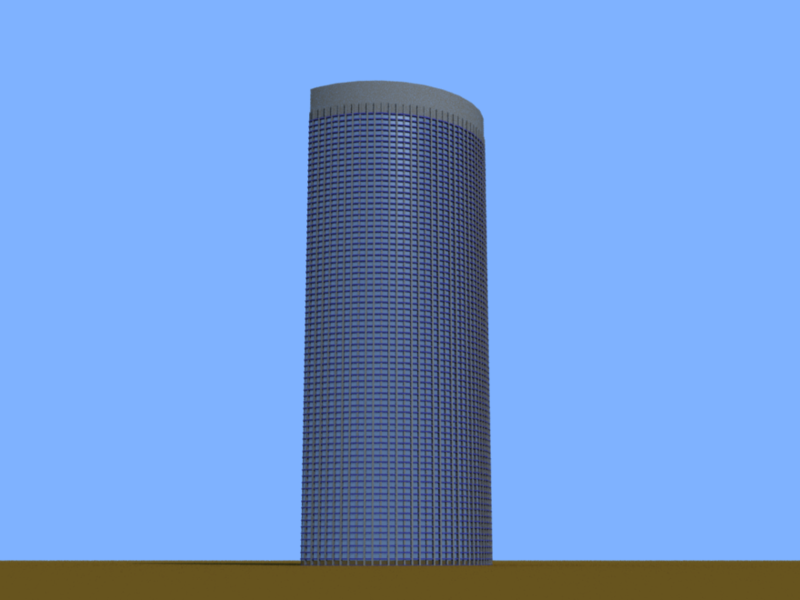 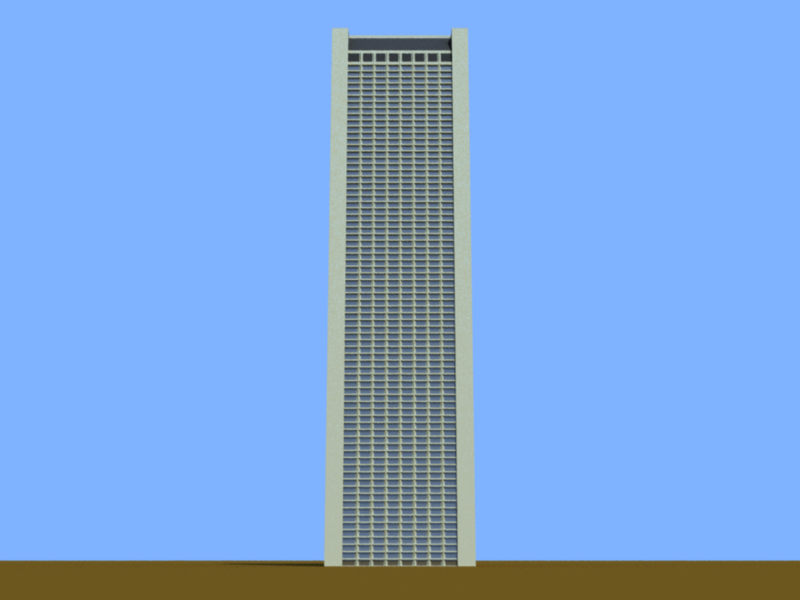 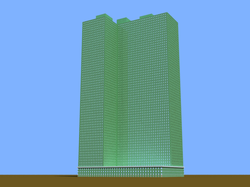 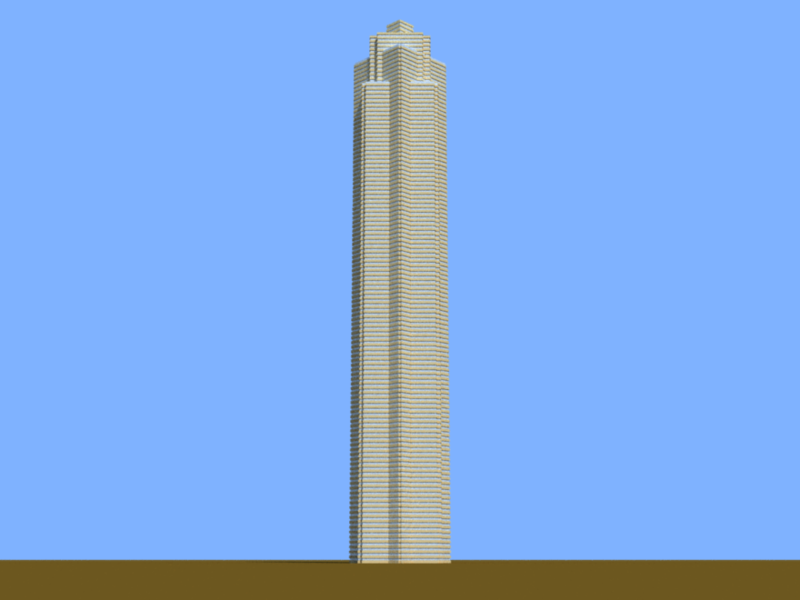 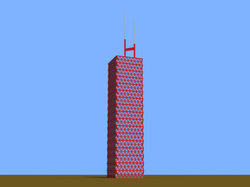 A 1960's style skyscraper, based on one in Chicago. 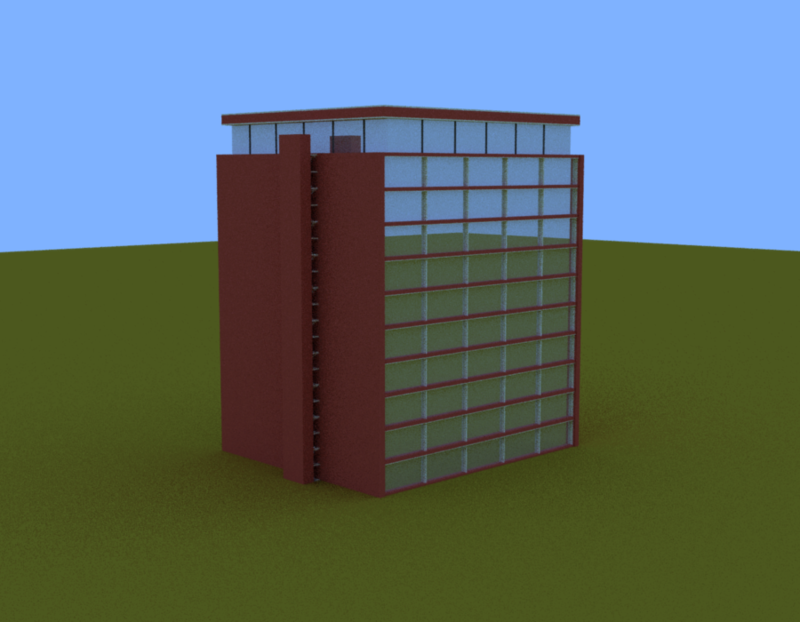 A building with a slashed top, inspired by one in Chicago. 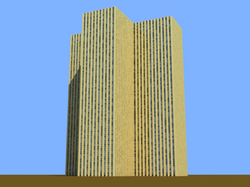 rectangular to rectangular with corners cut off. 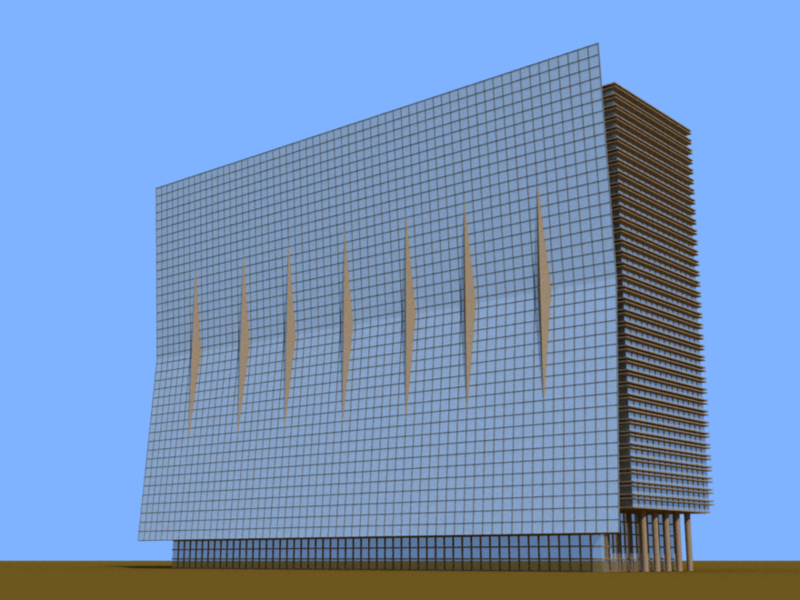 A building of several staggered layers. 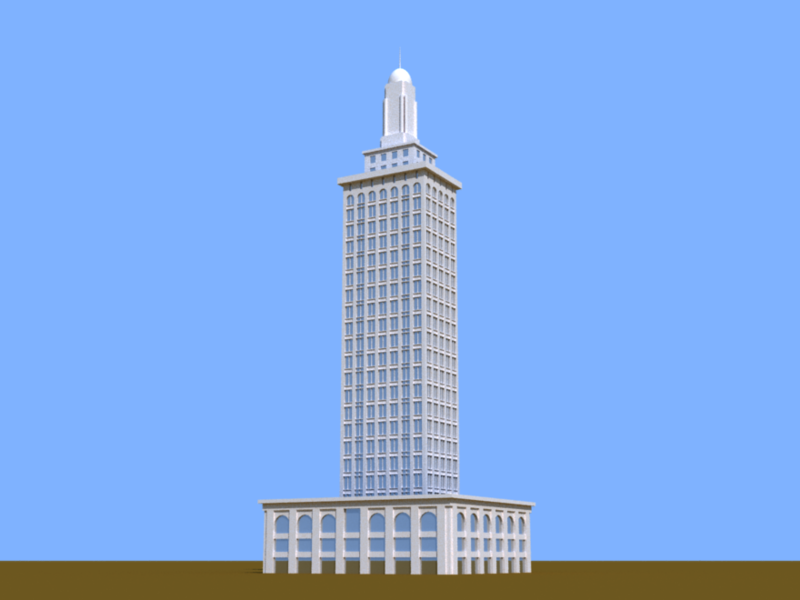 based on a building I saw in a 1932 photo of New York City. 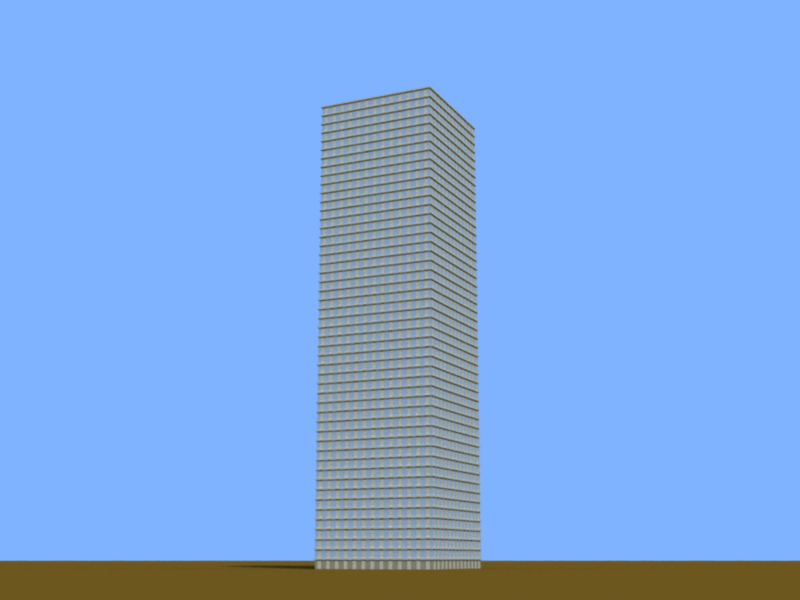 from childhood recollections of the proposal. 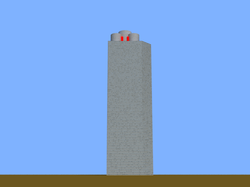 The Kimbal tower on the BYU campus in Provo Utah. 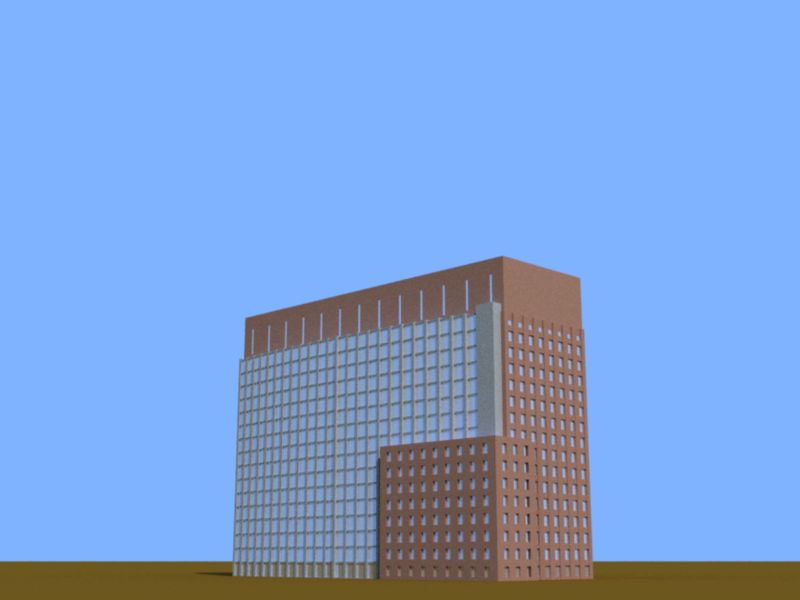 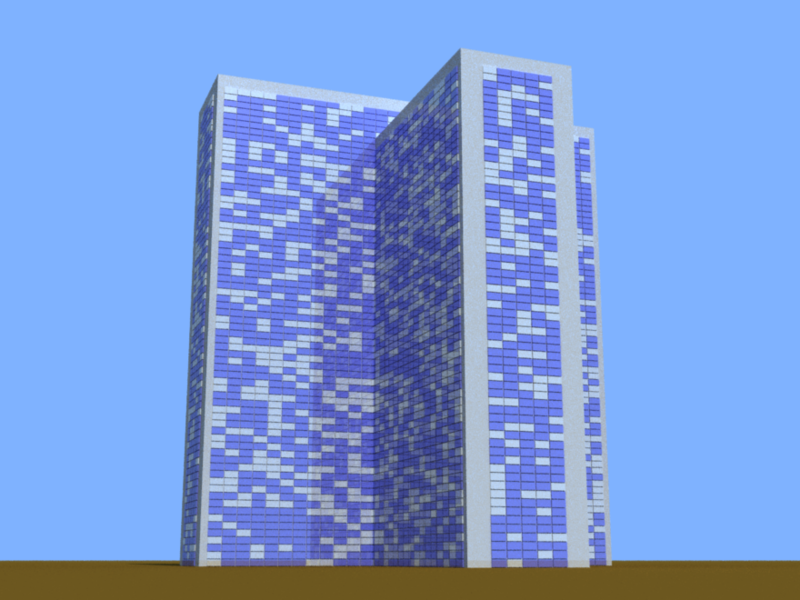 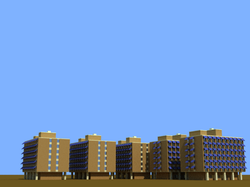 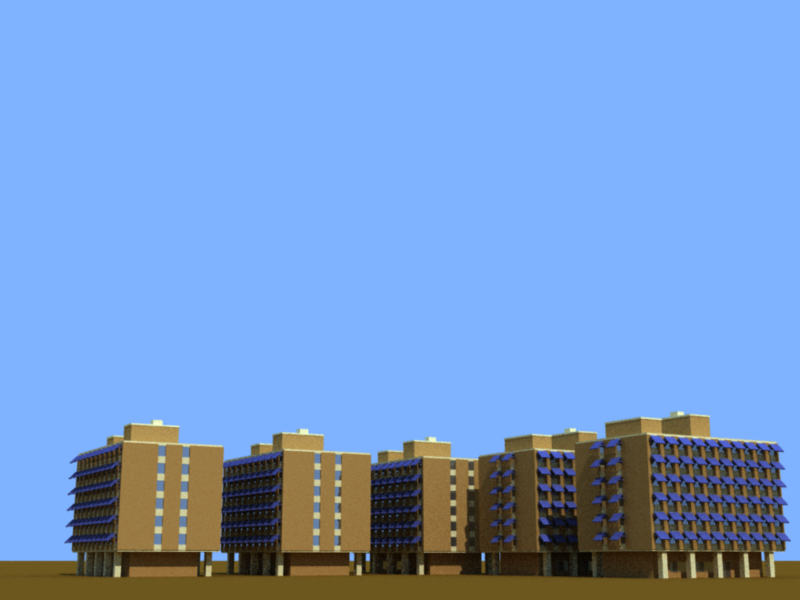 A building in three sections, kind of based on a hospital in Rotterdam. 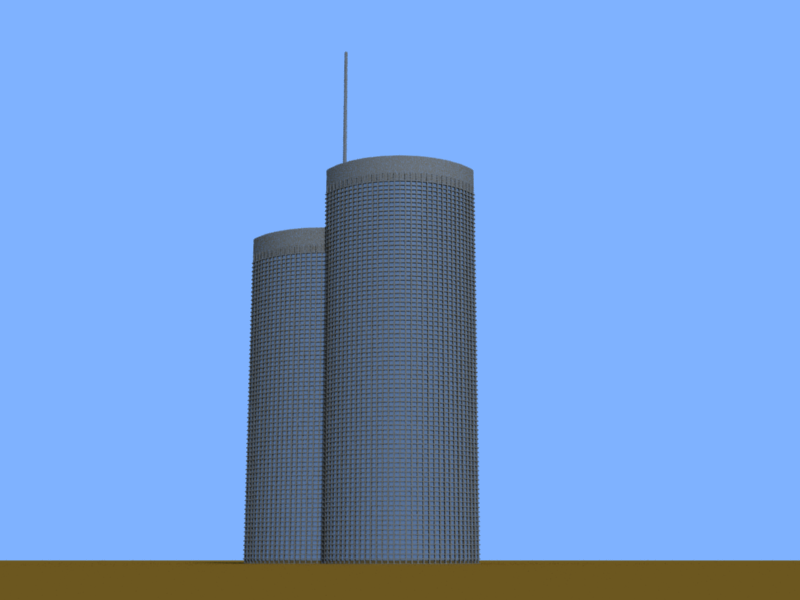 Three towers on a common base. A building similar to the Title and Trust building in Chicago. 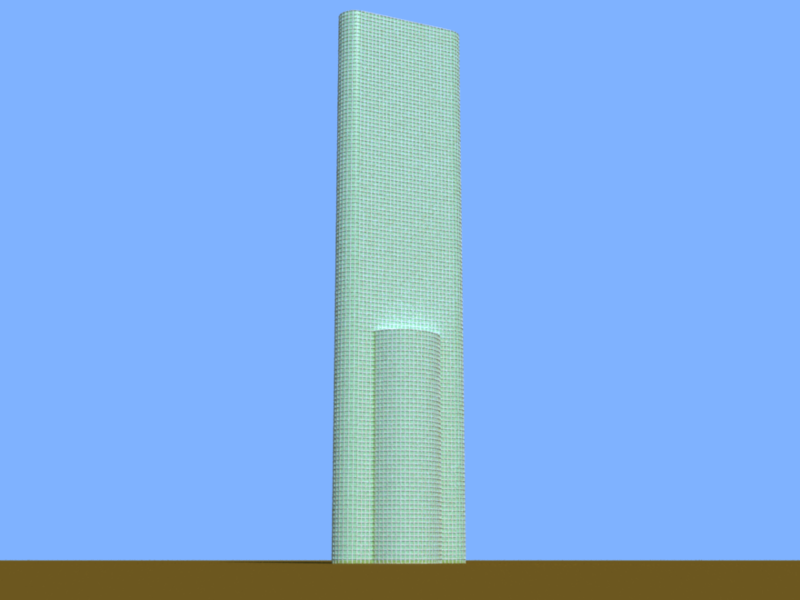 available in single color or two colors. A building triangular in profile, optional cable between antennas at the top. 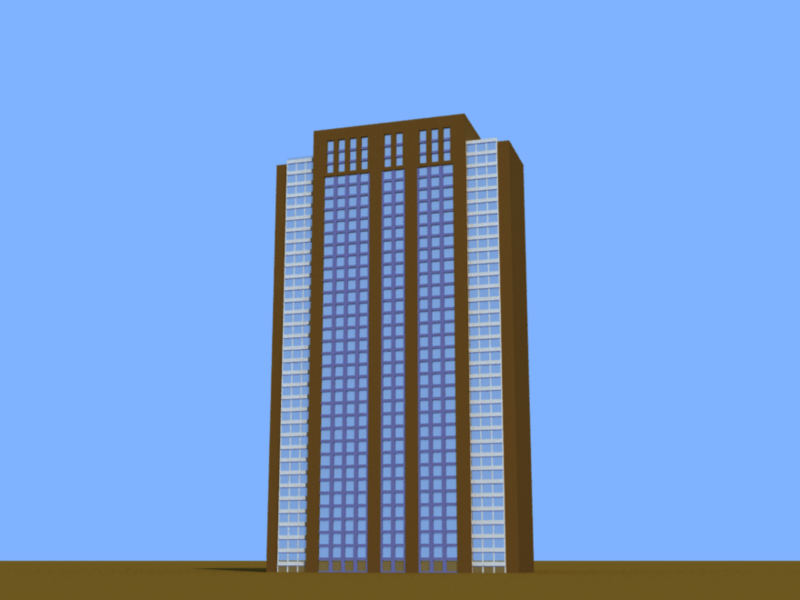 A building with a tweezer top. 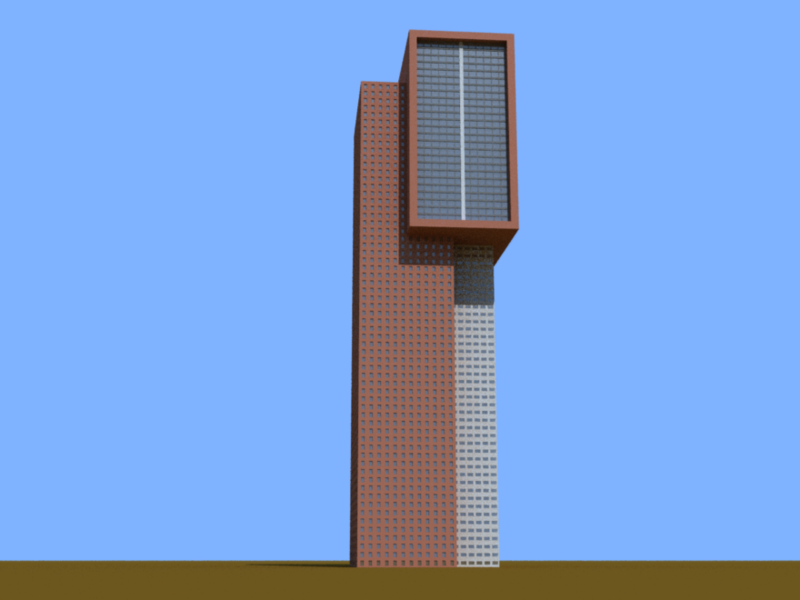 A building with a twist, a little like Turning Torso in Sweden. 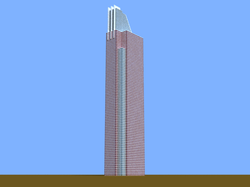 adjustable space between. 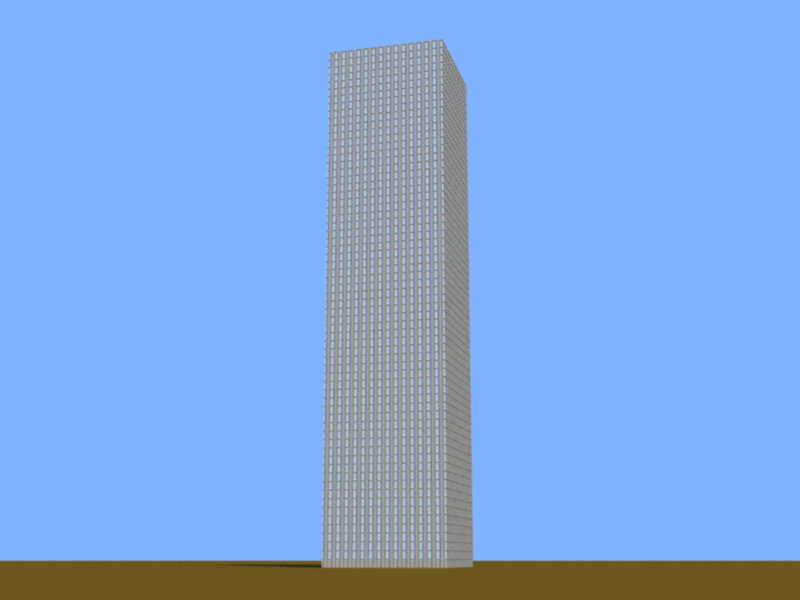 second building 83% as tall as the first. 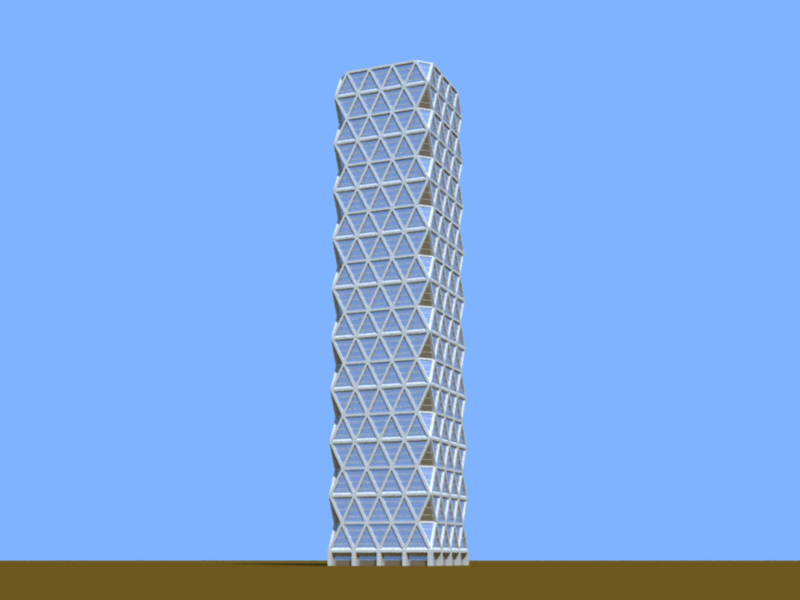 An oblisk. 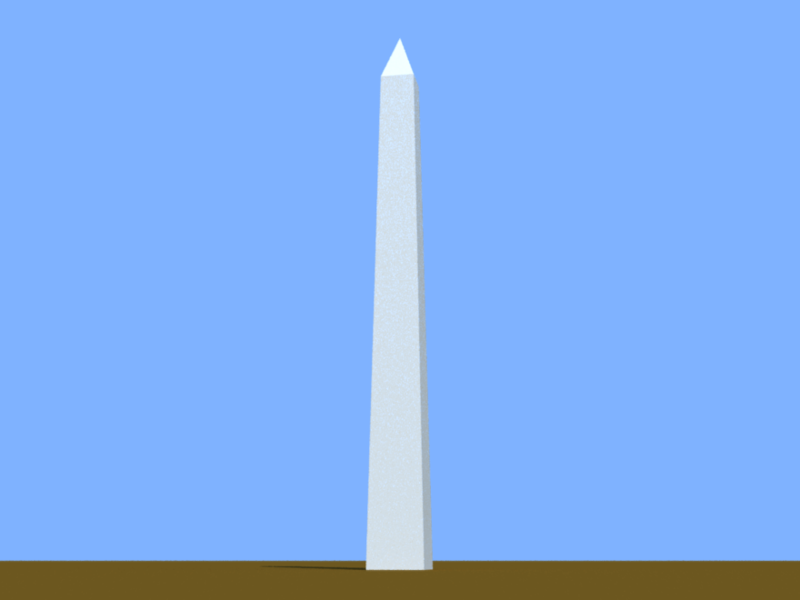 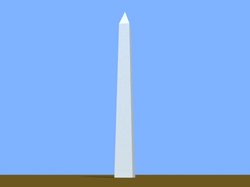 Proportions from Washington Monument. 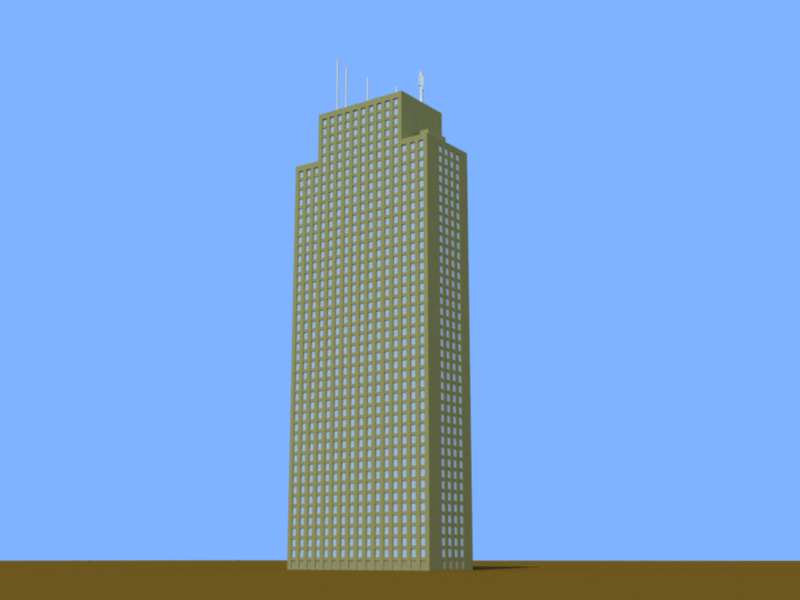 A building simmilar to the Williams Tower in Houston. 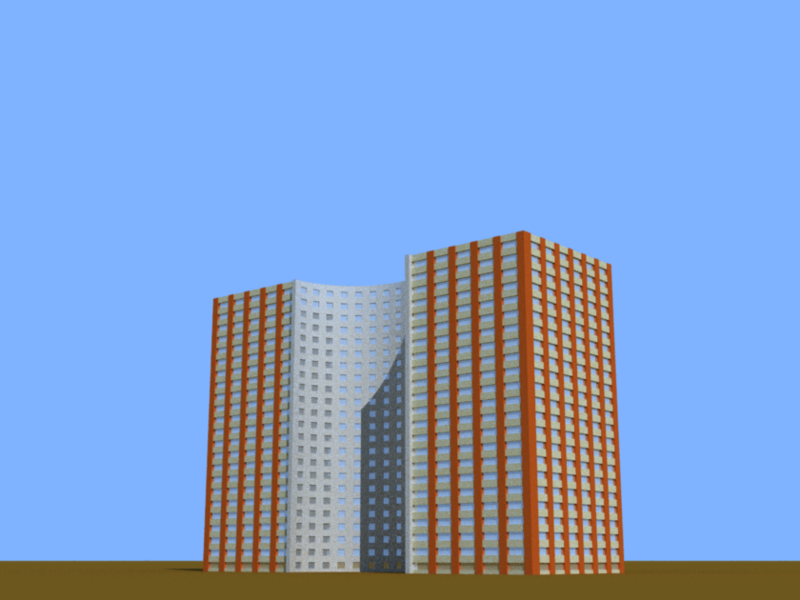 Three identical buildings in a row. 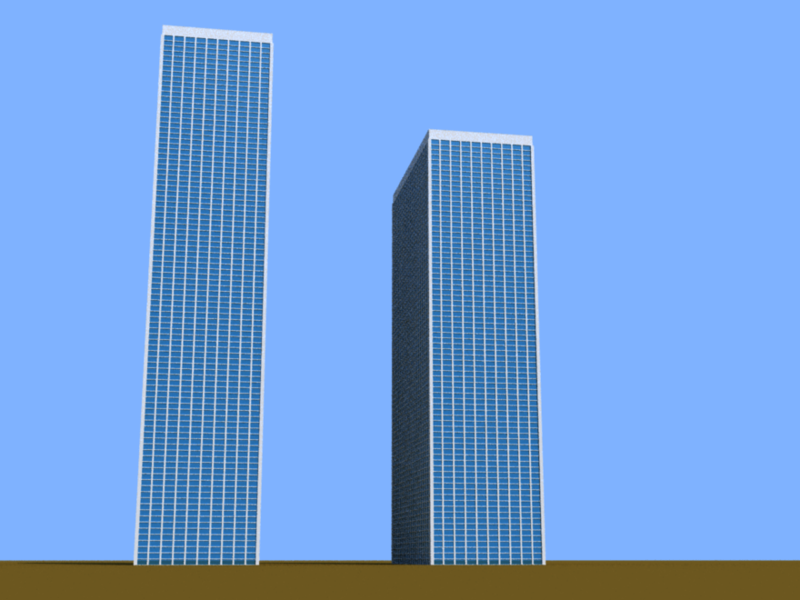 Buildings divided into thirds. 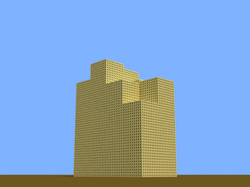 A ziggurat type building, characterized by multiple setback on all sides.